Who Is the Arne Jacobsen of Urban Food? At a workshop on food in cities at Aarhus School of Architecture in Denmark last week I learned: that the largest food exporter in Sweden is Ikea (meatballs); that for every meal eaten in a UK restaurant, nearly half a kilo of food is wasted; that about 40 percent of the food produced in the United States isn’t consumed; that every day, Americans waste enough food to fill the Rose Bowl;that US citizens waste 50 per cent more food today than they did in 1974; and that that doggy bags are taboo in Danish restaurants. These were spicy facts to be confronted with – but what is one to do with this sort of information? 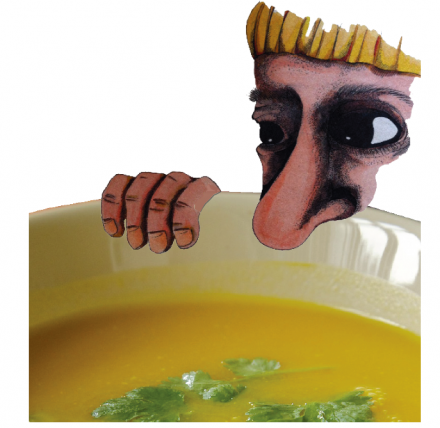 Food waste is just one among a bunch of ‘wicked’ questions concerning food in cities. There are no simple answers. Half the time, there is no consensus on what the problem is. 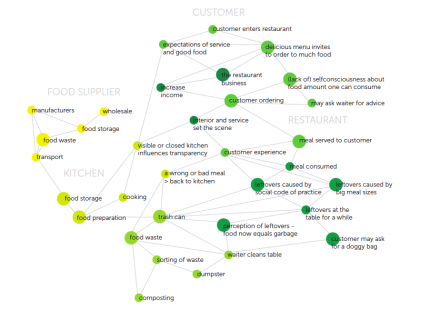 The image above, for example (given to me by one of the Aarhus students, Christina Amelie Jensen), plots the different actors that inhabit the food waste ‘issue space’ – just in restaurants. A constellation of mixed agendas and often conflicting motives is plotted on this map of the people who need to cooperate: farmers, food distributors, chefs, customers. Even language is a challenge; the Aarhus students found that the word “waste” was an obstacle to communication when they went to talk to people; it made many of them defensive and closed. My host in Aarhus, Peter Krogh, joked that we were looking for an Arne Jacobsen of urban food systems. But although armchair urban farmers are not hard to find, equipment is low down the list of design priorities on the ground. The activation of ecosystems in cities, it turns out, is more cultural and organisational, than artifactual. To make matters harder: there’s a lot of knowledge out there, but territorial planning for resilient food systems, urban agriculture, and ecosystem management, are complex and multi-dimensional activities. We nonetheless concluded, in Aarhus, that there are plenty opportunities for designers to do useful work here. A successful issues map, for example, like the one shown above, can be as valuable a design outcome as the blueprint for a structure, or system. At a city-region scale, in particular, new and better tools are needed to monitor, map and evaluate food flows. These are tasks that service and interaction designers can help with. 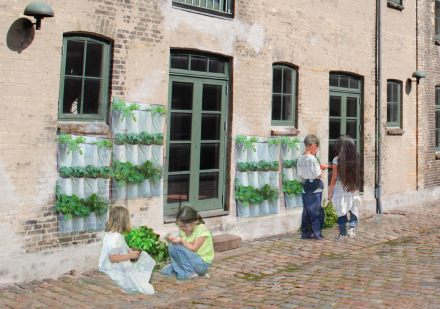 Many people are developing ways for schools to get involved in food growing, too – and one of the the Aarhus groups (below), having discovered that most Danish schools lack both the space and the time to grow food on a large scale, was keen to introduce a lightweight and easily deployed kit of parts that could be sneaked in to liminal schoolyard spaces. – architecture deals with wholes – unlike science, which breaks things down into parts. At a time when big-name architects are under fire for “bleeding cities dry” with the fees they earn from the design of iconic buildings, it was encouraging to witness the next generation of designers engaging with tough questions urban food. But our encounter quickly confronted a painful reality: hard questions of poverty, and land-grabs by the rich in distant countries, have as much impact on the food we eat as the portions we waste in restaurants. A a US charity called Halfsies, for example, has set out to educate Americans about food waste, and help poor people in Africa, at the same time. Their features a heart-warming photograph of four abandoned babies being fed at a home in Gulu, Northern Uganda. Trouble is, the Halfsies booklet does not mention the probable reason those orphans are homeless in the first place. As this film about land grabs for oil in Uganda explains, it is because investors from our own rich countries are grabbing land, and displacing the poor families that used to live on it, that children like these used have ended up in this predicament. Urban farming is a cool design topic these days – but if we’re to make a serious impact on the global food system, we need to show meaningful solidarity with its victims in distant places, too. This entry was posted in food systems & design. Bookmark the permalink. Post a comment or leave a trackback: Trackback URL.